As you may remember from previous posts, I'm part of the Empower Circle of do. Good Stitches. Well, our group decided to take August off to get caught up on our dGS quilting projects (and to get caught up on life). I have to admit, I was feeling all proud of myself for finishing my quilt in a timely fashion...until I realized that it's almost my turn again...which means I was just as slow as I was the first time around! Oh well...a finish is a finish! The size would have been perfect with the blocks made by the group, but it was eating away at me to only have 2.5 warm diamonds on each side...so I made a few extra blocks and sprinkled them in to bring it to an even 3 and appease my OCD side. I exercised a LOT of self control by not using it for a nap or keeping it for myself. I really, really, really love this one! Since the front was a tad busy, I kept the back muted and simple. The whole back is made of this soft taupey-gray...it's one of my all-time faves. You can also see the quilting there. I wanted to do some sort of free motion, and since I did stippling on the last one, I gave it the old loopity-loop this time. It went really quickly! (Side note: I tend to make small elongated loops so my exercise with this quilt was to keep them big and round...is anyone else singing Baby Got Back right now?) 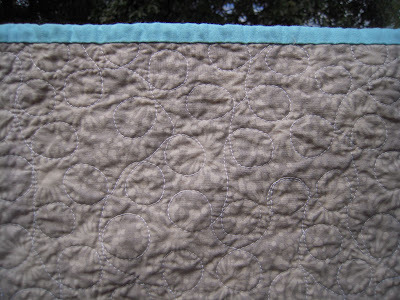 For the binding, I used one of my other favorites, Pure Organic in Aqua. 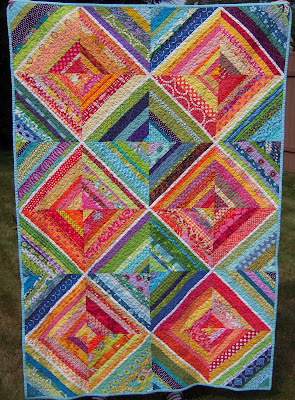 It worked really well with the bright piecing and I LOVE the way it looks with the backing fabric! It ended up being a generous lap size - I think it might work as a twin coverlet - it will definitely work for napping. 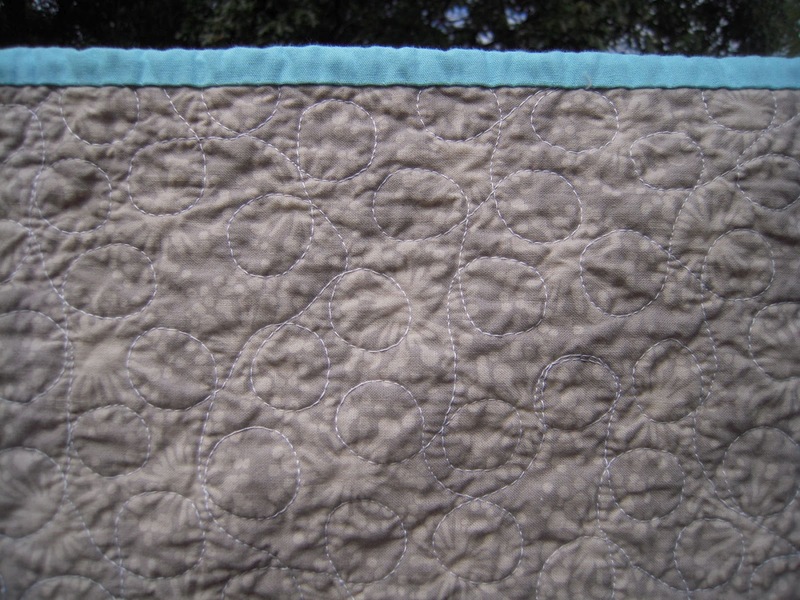 (I promise, I didn't use it...I just measured it against my usual nap quilt....pinky swear!) 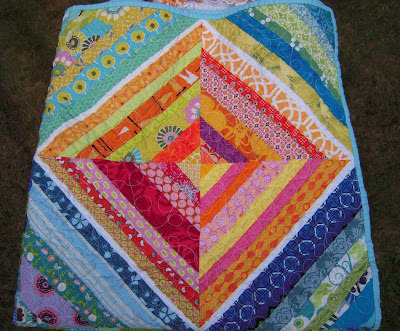 So now it's off to fulfill its quilt destiny at Alternatives for Girls!! Happy travels, quilt! This turned out to be beautiful! Great concept and vision! Btw I wouldn't have been able to leave the warm squares as halves either. This looks amazing. 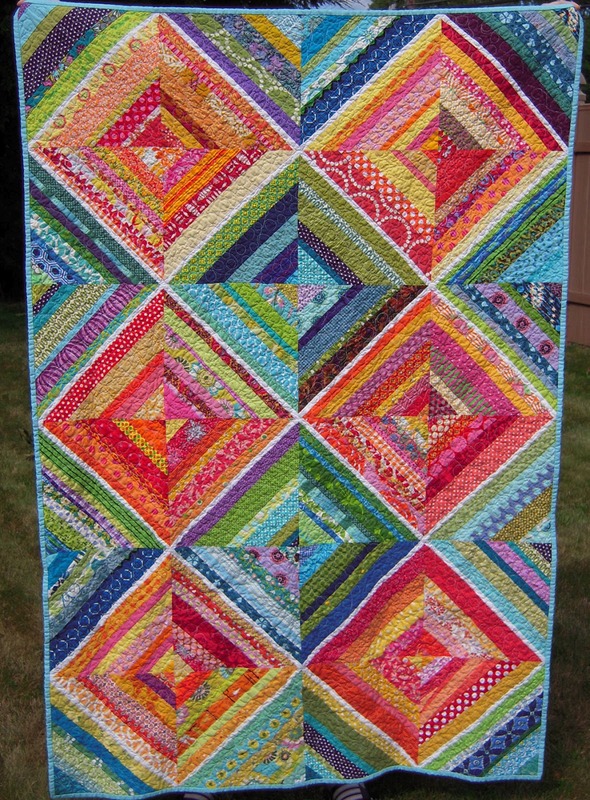 It makes me want to do another string quilt! Shannon, this is freakin' awesome. It's gorgeous. I love it.